‘Is Dutch a difficult language to learn?’ That is a key question and the answer depends on many factors. If you speak German, Dutch is not very difficult because the two languages are very similar. Young people learn foreign languages more easily than older people. But what is young and what is old? Another important factor is interest in the language and a strong desire to learn it. Let this not prevent you from trying to speak Dutch when you are in Amsterdam. Many foreigners in the Netherlands have a hard time practicing their Dutch on the locals. Most Dutch speak reasonably good English and the moment they hear a foreigner struggle with the Dutch language, they switch over to English. This seems kind, but in fact it isn’t. The aspiring foreigner never gets an opportunity to practice his or her Dutch. 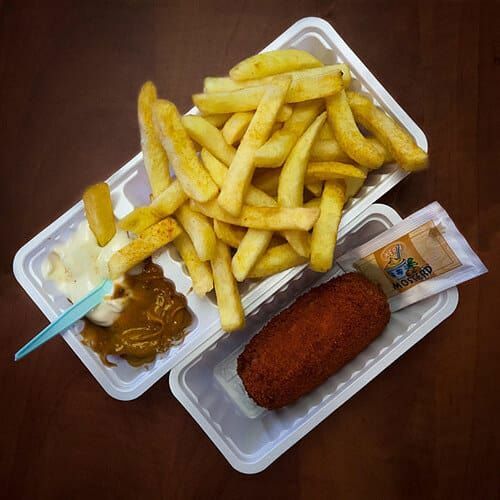 If you go to one of the Febo snack bars in Amsterdam you may overhear the following conversation of a British tourist ordering chips in Dutch. ‘Chips, please,’ the tourist says in a small voice. ‘Bedankt,’ says the boy and sneaks off. chips with spicy peanut sauce and mayonnaise.